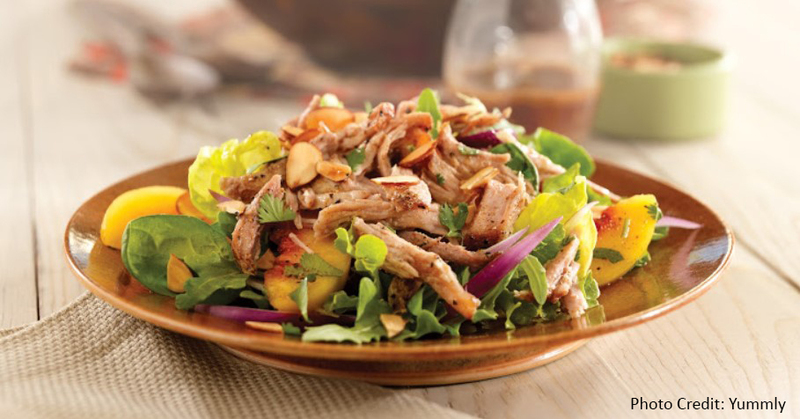 Pulled pork salad with peaches | MICHIGAN GROWN. MICHIGAN GREAT. In a small bowl, whisk together the vinegar, oil, brown sugar, ginger and allspice. Season with salt and pepper and set aside. In a large mixing bowl, combine the greens, peach, onion and cilantro. Add some of the dressing and toss. Arrange the salad on a platter or plates and top with the pork. Drizzle some of the remaining dressing over the pork, top with the almonds, and serve.